Peak oil, peak car, peak house? 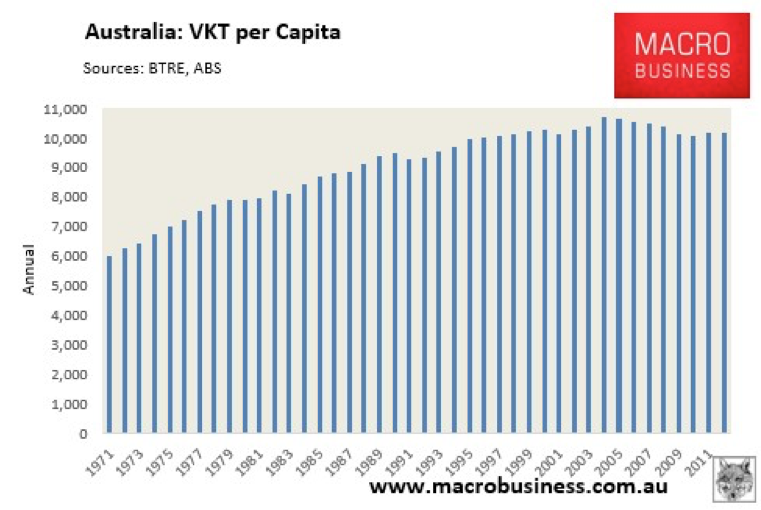 There’s been a bit of talk in the media over the past week or so about ‘peak car’ in Australia. 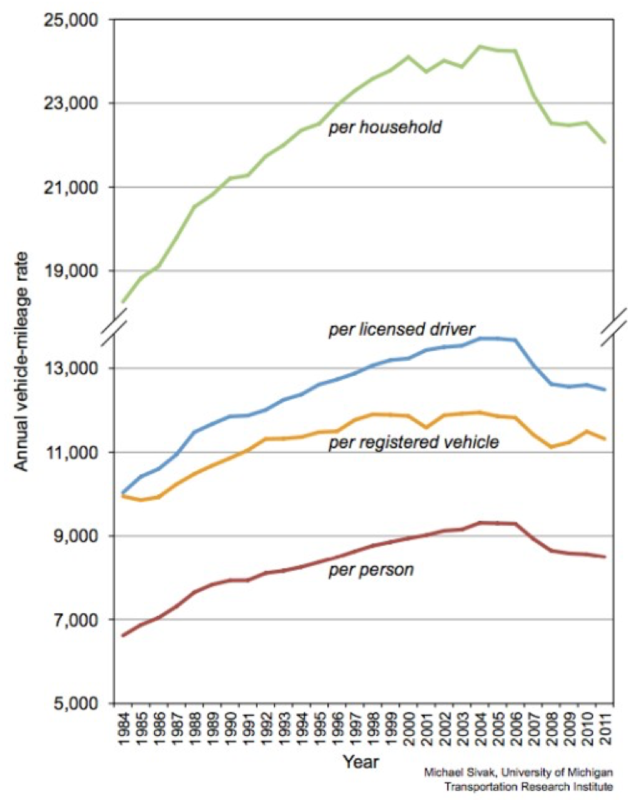 This is the idea that car use in Australia seems to have peaked. The term of course comes from ‘peak oil’ – the idea that oil reserves had peaked and were entering decline. This was big news in the 70s and 80s. Many said it meant the end of modern economies – which shows you just how hard it is to predict the future! But while peak oil was a supply side issue, peak car is all about demand. The number of vehicles on our roads – over 12 million in 2013 – continues to rise. However, we seem to be buying less new cars, and relying more on used vehicles. New car sales fell sharply following the GFC, and have not recovered since. They are now at their lowest, per head of population, than at any time in the last 20 years. Not only that, but the amount that we’re driving these vehicles is falling as well. This graph here charts vehicle kilometres travelled per capita. As you can see it peaked in back in 2004 and has been trending lower since. But this isn’t simply an Australian phenomenon. The same thing seems to be happening across the developed world – in NZ, Europe, and even in America. This chart here looks at car miles per capita in the US, with a clear peak around the GFC. All this is bad news for the car industry. Profits for auto-manufacturers are all in new sales, and they’re tanking. And if people are driving their cars less, it means they’ll get more years of service out of the same stock of cars. There’ll be less churn in the car market. And ride-share services like Uber are bringing even more disruption to the market. And that’s before we even start talking about the driverless car era! Anyway, I find all this interesting because it shows you just how important the structural features of a market are. For example, car prices have been falling – as technology improves and more imports come out of Asia, and with the recent strength in the Aussie dollar. You’d expect that falling prices would translate to more car sales, but that just hasn’t happened. It’s not that it didn’t encourage more car buying – it’s just that it got swamped by other factors suppressing sales. And pretty much no one saw it coming! Increasing car consumption was a trend that was in effect for 40 years. And it seemed to turn on a dime over night. And I think there are some interesting parallels with the housing market. To start with, I think citizens are generally becoming much savvier with their consumption spend. Partly this is in response to the tight conditions of the GFC, but I think it’s a broader trend that comes with greater financial literacy. And I think that what a lot of the talk of peak car misses is that people are increasingly less willing to pay a premium for ‘newness’. A car loses a tonne of value as soon as it’s driven off the lot. It makes for a terrible investment in purely financial terms. But that also means that if you’re a buyer, you can save a heap of money by going straight to the second hand market. If you’re willing to let someone else drive your car for a couple of years, you can save like 50% on the purchase price. It’s hard to argue with those numbers. That new-car smell is only worth so much. And you can see the same thing in housing. There are a lot of development costs factored into the price of a new house. The marketers, for example, have to make their margin. But you can’t on-sell these benefits. And so you end up taking a hair cut as soon as you take it back to the market. And when you factor in the fact that a lot of people like to personalise their properties, and a lot of investors (particular my students!) are looking for ways they can build value themselves, it gives the existing housing stock a distinct advantage. I think the lot-premium helps explain why we’ve seen a shift towards used cars in recent years, and why existing property tends to outperform newer houses. The other parallel is in the importance of preferences. Part of the trend against car use has been greater take-up of public transport, and shifts in our lifestyles. Again, these are partly lifestyle preference, partly economic. I wonder how housing tastes will shift over the next ten years. For a while we’ve seen a trend towards larger houses with more rooms. 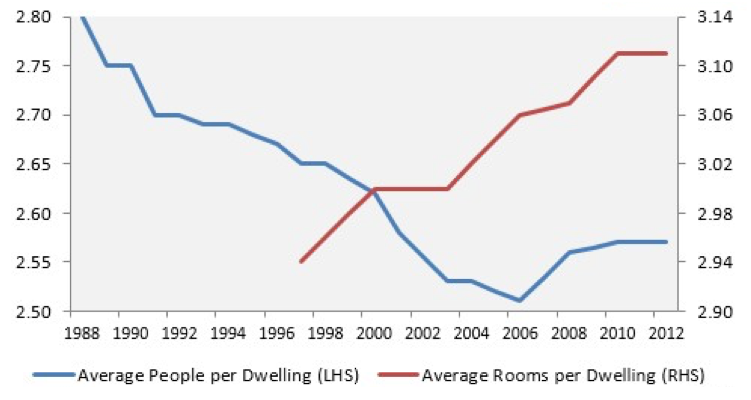 The number of people per dwelling has fallen, but the number of rooms per dwelling has risen. I wonder if we might see some push back against this at some point in the future. Extra rooms are a bit of a luxury – in the sense that you could probably do without them if the family income took a hit. In this sense, granny flat developments and ways to turn larger properties into multiple occupancies could be the lucrative way of the future. This is one trend I’ll be watching closely. But peak car, and the possibility of peak house (? ), show that as investors, we need to keep ourselves across not just the cyclical business-cycle dynamics, but shifts in the structural features of the market as well.